Want to become President of the Galaxy? With Cosmocracy you can do just that. 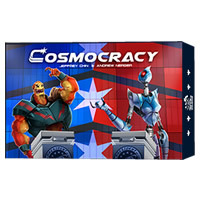 Cosmocracy is an entertaining party game where players argue over controversial issues plaguing the universe by making up facts and pandering to the alien races to win the most votes. Cosmocracy game rules and instructions are easy to read and learn how to play. This party game is great for up to eight people and doesn't take more than a half hour to play. Try something new for your game night and test your presidential skill with the game Cosmocracy. If you become elected President then you'll win. Included are 48 issue cards, 48 matter cards, 6 race cards, 6 candidate cards, 40 vote tokens and the official Cosmocracy game rules and instructions. Please keep in mind that the official Cosmocracy party rules and instructions could be different depending on the game version you have. The rules below are some of the exact directions on how to play Cosmocracy. Share with us your comments, funny stories, tips, advice, strategies, creative ways to play, questions about how to play, problems with the rules or anything you want about Cosmocracy. All submissions will be reviewed within 24 hours. Click here to add your Cosmocracy comments.